Earthquakes like the one that woke residents from their beds on March 10 in Poland Township, Ohio, might become a more frequent occurrence in areas where fracking is becoming big business. Scientists are reporting mounting evidence that tremors can be tied to the much-debated drilling technique and related activities. What's not clear is who might be held responsible for the quakes. Fracking refers to the method the petroleum industry uses to break apart chunks of shale rock deep within the earth to free trapped oil and gas. Geologists in Ohio established a "probable connection" between fracking and the magnitude 3.0 quake on March 10. In Oklahoma, geologists report a spike in earthquakes associated with injecting into deep underground wells the wastewater generated during fracking operations. The heightened awareness of seismic activity associated with fracking and wastewater injection raises the question of who is responsible should an earthquake occur that causes damage to people or their property. From the industry's perspective, the question "is purely hypothetical because the very few seismic events that have occurred haven't caused any damage whatsoever," said Shawn Bennett, a spokesman for Energy in Depth, a Washington-based industry trade group. He added that, "You can't just assume that there will be further damaging earthquakes when there is just no evidence that supports that." Oil and gas companies have nevertheless likely "gone out and covered themselves through commercial policies" in case their activity causes a damaging earthquake, Mike Barry, a spokesman for the Insurance Information Institute in New York, told NBC News. Several major insurance brokers and consultants for the energy industry asked about the availability of such policies declined to comment. 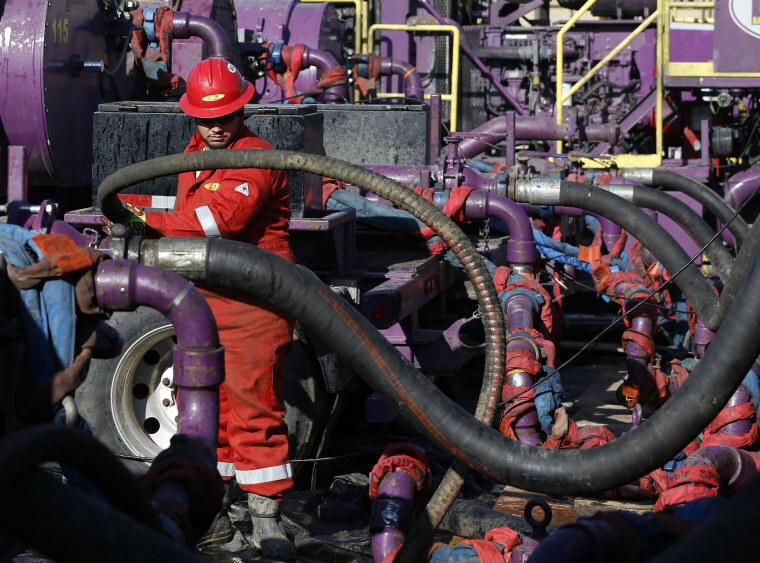 "While we can never be 100 percent sure that drilling activities are connected to a seismic event, caution dictates that we take these new steps to protect human health, safety, and the environment." As for homeowners, Barry said, earthquake damage is not covered under typical homeowners' policies. "This is a standard exclusion that comes under the umbrella of earth movement," he explained. But, homeowners can purchase a separate earthquake policy and in most areas of the country these are "fairly inexpensive." One caveat is that in Ohio at least "some of those policies don't cover induced earthquakes, they are just sort of naturally occurring earthquakes," said Ray Beiersdorfer, a geologist at Youngstown State University and a vocal critic of the oil and gas industry's exploitation of shale resources. "So, in my opinion, now that we know that there is a seismic risk, the company should have to put some sort of bond out and they should be liable for any damage that they cause by the induced seismicity." While fracking has previously been linked to mild earthquakes — the largest a magnitude 3.6 in the Horn River Basin of British Columbia, Canada, in 2009 — "none have been large enough to be of concern from an earthquake hazard perspective," William Ellsworth, a seismologist with the U.S. Geological Survey in Menlo Park, Calif., told NBC News in an email. The magnitude 3.0 in Poland Township is only the second time out of 1.2 million wells fracked in the United States that a probable connection to earthquakes has been established from fracking, noted Bennett. The other incident was a 2.8 near Elmore City, Okla., on Jan. 18, 2011. "While the industry does take this very seriously, the seismic activity that occurred in Ohio was very minor and caused no structural damage," Bennett said. "Essentially, the magnitude of the event was the equivalent of a truck driving past your home." "This is a part of Ohio where we have old infrastructure in terms of water systems and sewers and lots of old brick buildings. It is really not set up for dealing with seismicity, even small seismicity." It was large enough, however, to heighten concern among observers and regulators of the oil and gas industry. "This is a part of Ohio where we have old infrastructure in terms of water systems and sewers and lots of old brick buildings," Beiersdorfer said. "It is really not set up for dealing with seismicity, even small seismicity." The concern helps explain why the Ohio Department of Natural Resources issued new permit conditions in April following its investigation of the March earthquakes. "Our experts determined a probable connection can be made between the small seismic events and hydraulic fracturing activities in the area," Mark Bruce, a spokesman for the agency, told NBC News in an email. Under the new conditions, outlined in a press release, permits for drilling within 3 miles of a known fault or seismic activity greater than magnitude 2.0 would require companies to install seismic monitors. If those monitors detect an event greater than magnitude 1, drilling activities would pause while the cause is investigated. If a probable connection to fracking is established, operations will be suspended. "While we can never be 100 percent sure that drilling activities are connected to a seismic event, caution dictates that we take these new steps to protect human health, safety, and the environment," James Zehringer, the agency's director, said in the statement announcing the new guidelines. The U.S. Geological Survey and Oklahoma Geological Survey expressed similar caution when they issued a joint statement on May 2 noting that the rate of earthquakes has spiked about 50 percent since 2013, which has "significantly" increased the chance of a damaging magnitude 5.5 or greater quake in central Oklahoma and encouraged residents to be prepared. A "likely contributing factor to the increase in earthquakes is triggering by wastewater injected into deep geologic formations," the statement said. Wastewater injection "is the primary earthquake hazard concern" related to oil and gas exploration, Ellsworth said. The largest industry-linked earthquakes recorded to date, including 2011's magnitude 5.6 earthquake in Prague, Okla., and a magnitude 4 earthquake in Youngstown, near Poland Township, have been associated with the injection of wastewater from drilling activity. "You can't just assume that there will be further damaging earthquakes when there is just no evidence that supports that." Earthquakes related to drilling activity occur because "there was a pre-existing fracture or crack in the earth and then it moved," Beiersdorfer said. "What is happening with these induced earthquakes, either from injection wells or now injecting the frack fluid, is that the extra fluid is raising what's called the pore pressure and that is relieving some of the stress" that prevents the earth from moving. According to the Ohio Department of Natural Resources' statement about its investigation of the March seismic activity, "the sand and water injected into the well during the hydraulic fracturing process may have increased pressure on an unknown microfault in the area." What's unclear is where in the rock this fault exists — the shale where the drilling occurs, or deeper so-called basement rock. An answer to this question, in turn, could help guide the industry and its regulators on where and when to issue permits for drilling activity, according to Beiersdorfer. If the crack is in the basement rock, for example, that could be a sign that drilling activity should stay further away to prevent fractures running deep enough to trigger more earthquakes. If the crack is in the shale itself, then "the burden should be on the companies to prove that there are no potential earthquake faults there before they get the permits to go forward and frack," he said. Most of the companies, he noted, obtain seismic reflection data from the shale in order to plan their operations. Existing faults, he said, would show up in that data. But, for now, that information is considered proprietary and not shared. Bruce said the probable connection between the March 10 earthquake and fracking is based on a review of "a range of data: seismic recording data from multiple stations in the region, well stimulation and completion records indicating pressure and time of operations, as well as structure maps and seismic reflection data showing the geology of the area."